Everything I’ve ever researched about getting into shape comes to this conclusion: diet and exercise go hand in hand. Luckily, I know the perfect workout: swimming! And the Underwater Audio Waterproof iPod makes the time fly fast while I’m doing it which really helps! But still, some questions remain. How long should I swim? Which stroke burns the most calories? What’s a good swimming strategy ?!! How Long Should I Swim ? Since I chose to swim 4 times a week, I decided to swim for at least 40 minutes. That’s 160 minutes a week. The recommendation according to my super tracker profile was at least 150 minutes per week so that exceeds the target minimum. I feel like its best to start my goal at the minimum. If I do extra, it’s an advantage, of course. But that way I’m not getting burned out by setting an unrealistically high goal from the start. Which Stroke Burns the Most? 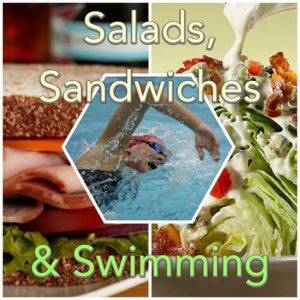 I’ve been trying to use mostly the backstroke and the freestyle stroke since they burn 80 to 85 calories in 10 minutes. And the breaststroke only burns 60 calories in 10 minutes. 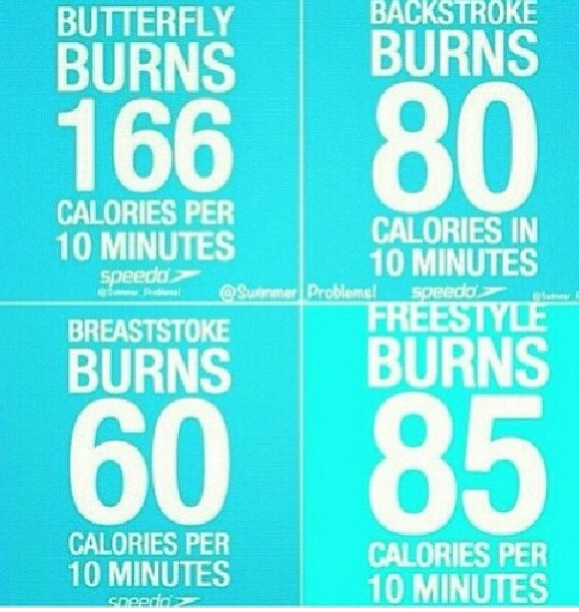 I would’ve choosen the butterfly stroke… since it burns by far the most calories (166 in 10 minutes). But, I’ll be honest… I’m not very good at it. I thought long and hard about why the butterfly would burn so many more extra calories than the others and I think it has to do with the large sweeping movements in the resistant water. To try and get similar benefits, I decided to incorporate some vigorous water aerobics moves at the beginning and end of my swim to burn extra calories. According to the activity tracker on supertracker.usda.gov, vigorous water play also burns TONS of calories. So, maybe my comparison wasn’t too far fetched! It’s been almost a month since I started the challenge and it’s been going super well! Swimming four times a week is an adjustment when you have super long, tangly hair but I acclimated. And after coming to terms with that, everything went fine! I’ve lost about 12 pounds! It seems to be working! And I feel stronger too! My goal of this project was to get in shape and help other people to do the same. I hope the tools I’ve provided you with have helped.